A short while ago, graphic designer, Aaron Roessler called me up. 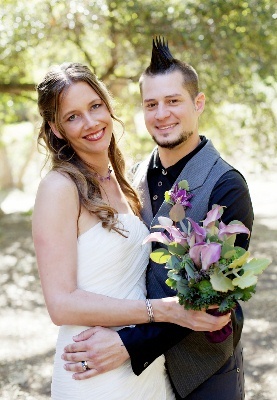 In young hip guy fashion, he'd found me, the Santa Barbara Jewelry designer on the internet. He told me he’d finally put ink to paper and drawn up a picture of the dream ring that had been kicking around in his head for a wedding band. I thought it’d be interesting if I outlined the steps we went through in making it. The first thing we did was to sit down and look at his drawing and discuss what he wanted. 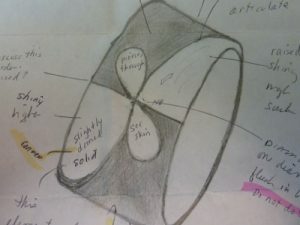 I listened while he explained the look he was going for, especially the three dimensional aspects of the ring that hadn’t been completely clear in his drawing. He also showed me two diamonds from a family ring that he wanted set. These two diamonds came from a ring that gave diamonds for the rings we made for his fiancé. After he was done I offered my input. I suggested increasing the width of the shank so people could really see the details he was drawing. We also agree on adding design details like convex curvature on the top part of the ring on one side to highlight the infinity symbol. After agreeing on the design, the next step was to carve the wax. I sat down with my wax carver to show him the design and to talk through the details. A week later, I showed the wax model to Aaron. He was thrilled by 90% of the look, but wanted to change one minor detail. 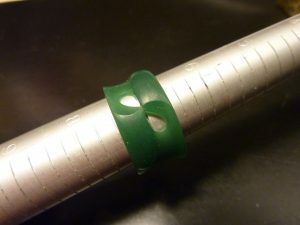 I was happy to make the change in the wax which is much easier than having to re-do a finished ring. I had my carver tweak the design to show the convex curvature extending farther down on one side. Then I took a picture of the modified wax and emailed it to Aaron. He wrote back and said it was great and to go ahead and cast it. 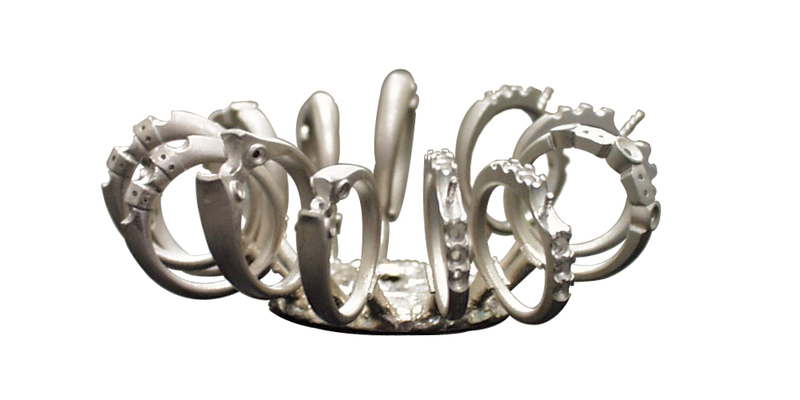 I had the ring cast with multiple other designs in a vacuum casting machine that gives a great result in lost wax casting. Aaron’s ring cast up just great. Once Aaron’s ring came out of casting it was time to polish the ring. This is a very important step. It’s not just about making it shiny and smooth. 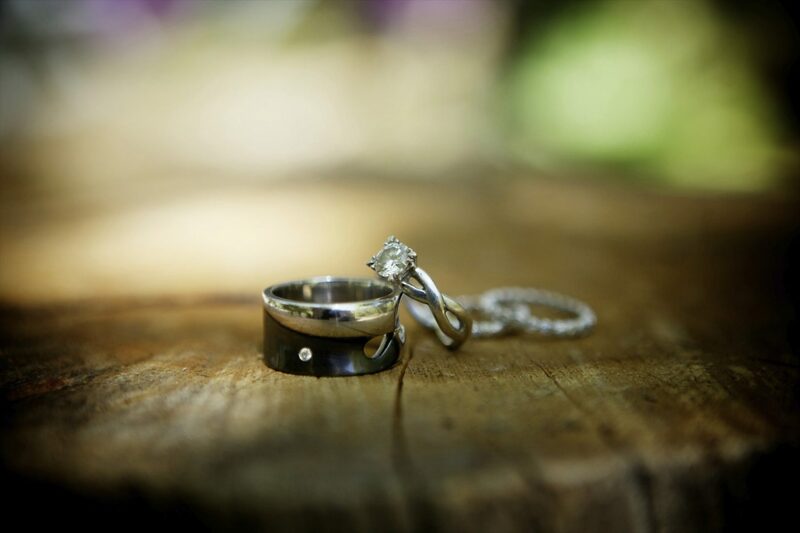 It’s a part of making your ring look artistic and balanced. When you look at a wax model it can freak you out; partly because it is colorful wax, which looks nothing like sleek and shiny jewelry and partly because it can look really bulky. When my wax carver and I do a design we often exaggerate some elements in the wax. 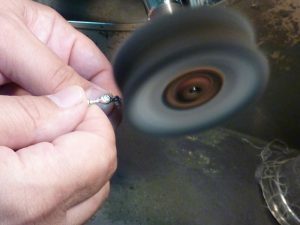 We make the prongs thicker and taller than necessary; we make the dome portion of a ring slightly taller in the wax than I mean it to be in the finished product, and other details can be carved slightly larger than necessary. We do this because when casting jewelry over the years you learn that for example that one prong that fails to cast can doom a whole ring cycle and force you to cast it all over again. After you’ve had a number of redo’s you learn to carve thicker prongs and taller domes ahead of time and polish them after casting to the height and thickness that you really want. Good polishing refines and completes the look that is suggested in your wax. At this point we set the two diamonds. Then the final polish was done to prepare the surface for the special finishes. Lastly, we added the black rhodium to the section we’d chosen and the ring was finished! I made an appointment with Aaron and met him at my local club a couple of days later. After we were seated, I presented him with his new ring. He was over the moon. It was everything—and more—that he had envisioned and he couldn't have been happier. I was thrilled with the whole project and excited for him that his design rocked so excellently! Love that infinity design. It’s so interesting to really see the process that a ring goes through from start to finish. Exaggerating some elements is a very smart move that one learns over the years with experience. So this is what jewelers in Santa Barbara come up with. Or rather their ridiculously talented graphic artist clients. Seriously I love Aaron’s ring. It didn’t look simple at all. It seems that getting it from the two dimensional drawing to the three dimensional reality would be a potentially complicated task. Aaron went to the right jeweler! 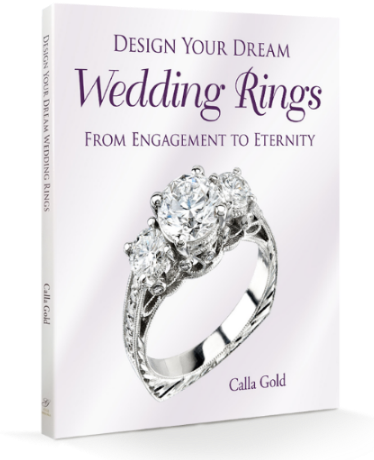 Calla Gold, that’s interesting to see how you implemented Aaron’s vision and turned his dream into reality. What a wonderful start to his marriage. 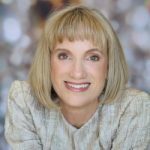 Thank you for sharing the steps of jewelry design with us. It makes it more real that it can and should be done! That my friend is a truly epic ring. The width is cool cuz it let’s the design and the black really show. I could wear a ring like that.